The colors from these crystal lamps are from natural minerals of the earth. These lamps are wonderful examples of the natural wonders that can be found within the earth. Each lamp is created with a large piece of Himalayan rock salt or Selenite that has had its core hollowed out, and has been fastened to a sturdy wooden base. This allows for the small light that comes with it to be placed within the piece of lamp creating a warm glow that is great for creating a soothing atmosphere in whatever room it is placed. Further, as these lamps heat up it is believed that they create healing negative ions, which are believed to help balance your electromagnetic field, purify the air, and generally help create a sense of serenity. Each lamp is a natural product of the earth. 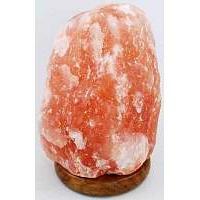 Salt is a crystal also called halite and is well-known for its cleansing, purifying properties. It is a very soft mineral and is extremely water soluble so don’t wet your lamp to clean it off, ever. Use these lamps wherever you just want the space to feel clearer, fresh, closer to nature or to create a more serene sacred space for yourself.